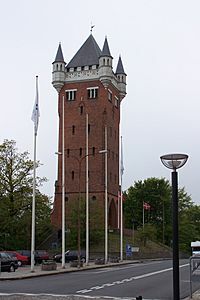 Esbjerg is a city in Denmark, on the peninsula Jutland. It has about 82,000 inhabitants and is the 5th largest city of Denmark. The growing began in the 1860's, because Denmark lost its North Sea harbours to Prussia in the Danish-Prussian-Austrian war. The new harbour was built in Esbjerg. Esbjerg Facts for Kids. Kiddle Encyclopedia.